A bit of the doldrums today... so I spent some time in the studio. No real art-ing done, however I did get some more organizing and cleaning done. My art for the day was making "fun foam" texture stamps for gelliplate pints using shapes I'd cut out some time ago. The board backings are recycled boxes, and the handles are (crookedly) cut corks. Here's a shot of the backside of one stamp. Ah well. I'll keep playing with it and perhaps one of these days get it to work I wish it to work. In the meantime, here's something from my "archives" that makes me happy. Wow, you are really getting creative Helen. Love what you have been creating. Great work. Good weekend to you. Nothing better than organizing and finding lost art products. I like the dark swirls with the shadow print too!! Nice tulips as well! 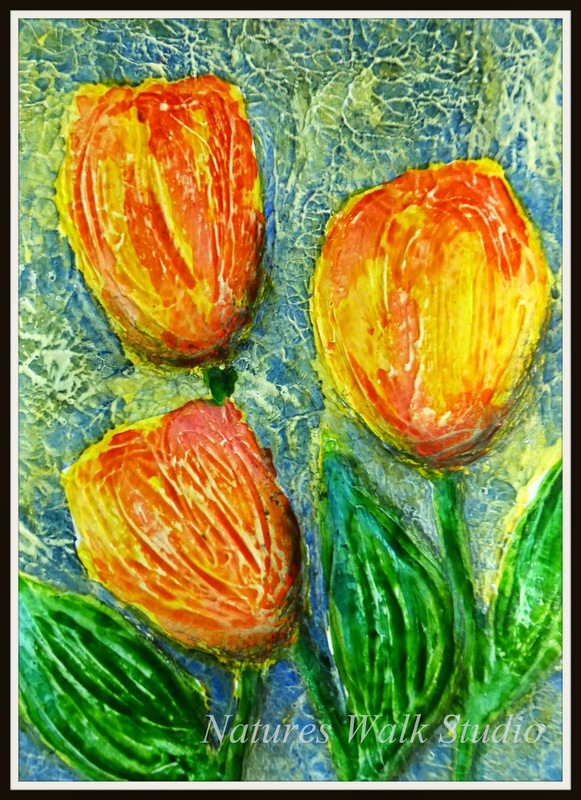 You're tulip piece is gorgeous-is it 3d? It looks like I could pick them right of the screen! 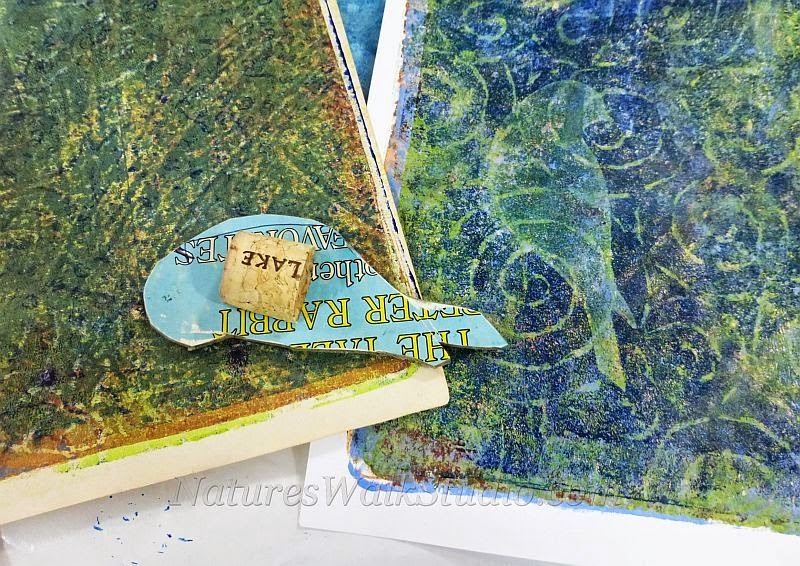 I still don't really understand Gelli plates but I think your backgrounds look grand-the bird stamp is lovely. 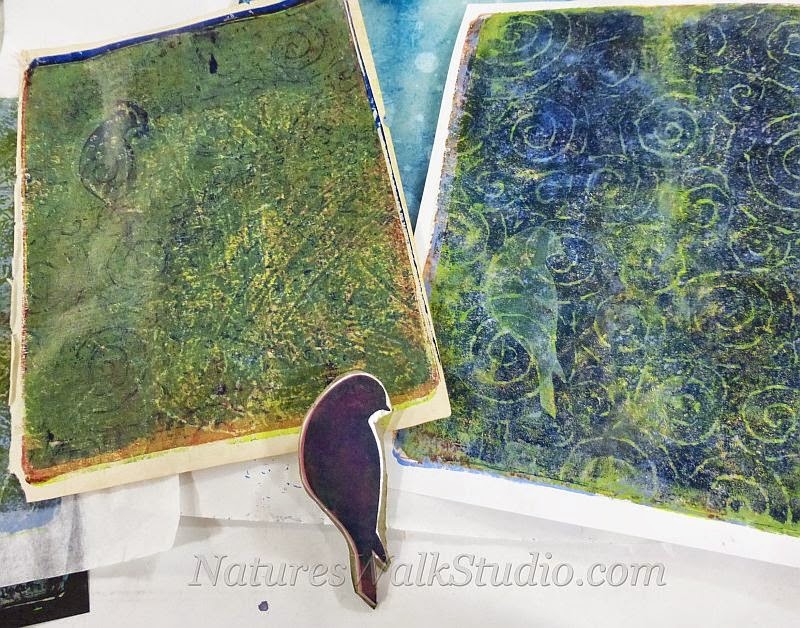 I think your gelli prints look great! I just bought one and have yet to try it. I love your foam stamps and the backgrounds you show with them. It is dreary again today, so a good time to stay in and art. So sorry you have been feeling blue. Your art doesn't show that at all. Wonderful colors. Glad you brought out the flowers to make you happy. GREAT idea for stamps!!! Hope today is full of happy. Your flower painting is gorgeous, and thank you for sharing such an interesting technique! Happy PPF! Good to organize,there are always treasures to be found. Love the tulips!